First referenced in the Ling Shu and the Su Wen, the Luo Collaterals or Luo Mai, are an integral part of the acupuncture channel system. In this book, Dr. David Twicken provides a comprehensive account of the Luo Mai, including detailed analyses of the classical and contemporary theories and clinical applications. Modern practitioners often use the Luo Collaterals to treat the emotions and the organs, with treatments influencing the blood network, especially the veins and capillaries, along the Luo pathways. Dr. Twicken presents a thorough historical analysis of the new theories on which our modern understanding of the Luo Collaterals and Luo points is based, and explains the applications. He explores the classical Chinese medical and Taoist interpretation of the Shen, the five Shen and the emotions and provides a comprehensive historical analysis of the Window of the Sky points. Dr. Twicken also includes instruction on Healing Sounds Qigong, one of the oldest and most effective forms used to treat the emotions, the internal organs and the five Shen. 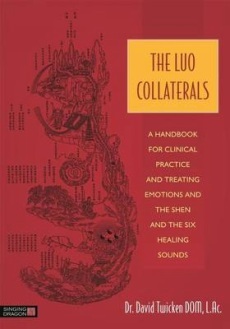 An accessible and authoritative guide to the Luo Collaterals, this book will be of immense value to students and practitioners of acupuncture and Chinese medicine, Taiji and Qigong practitioners; and anyone with an interest in Taoist practice. - Taoist Grandmaster Mantak Chia, Founder of the Universal Healing Tao and Tao Garden, and author of Healing Light of the Tao, Taoist Cosmic Healing, Awaken Healing Energy Through the Tao, and Emotional Wisdom. - Gregory E. LeBlanc, Ph.D., L.Ac., founder of Turning Point Acupuncture and Feldenkrais - Berkeley CA., Abbot and guiding teacher at Mountain Gate Zen Center - Berkeley CA., Chief Instructor at LeBlanc Wing Chun - Oakland CA.